Today didn’t start very well with us waking up looking at clock and realising it was 6.49 and we were due at FCs at 7.00. Good thing it is 5 minute drive away 🙂 We had an interesting morning with the routine – the boy was already up but doesn’t get dressed till after breakfast it appears so was sat watching TV with biscuits. He didn’t want much breakfast – FC said it was the same yesterday so think he is a little unsettled unsurprisingly. Once that was over it was get him dressed in lounge which ended up as FC says it usually does being fun as he did not want to be dressed. Eventually we managed and following a game of see-saw on FCs knees off we went. Once we had done that wandered back to the Deep past marina – which I know well as my grandparents lived in the sheltered flats that overlook the basin for around 20 years so I spent a lot of time around there in my teens and later. Managed to get handles on buggy set-up so it was more comfortable for me to push and also easier to deal with kerbs. 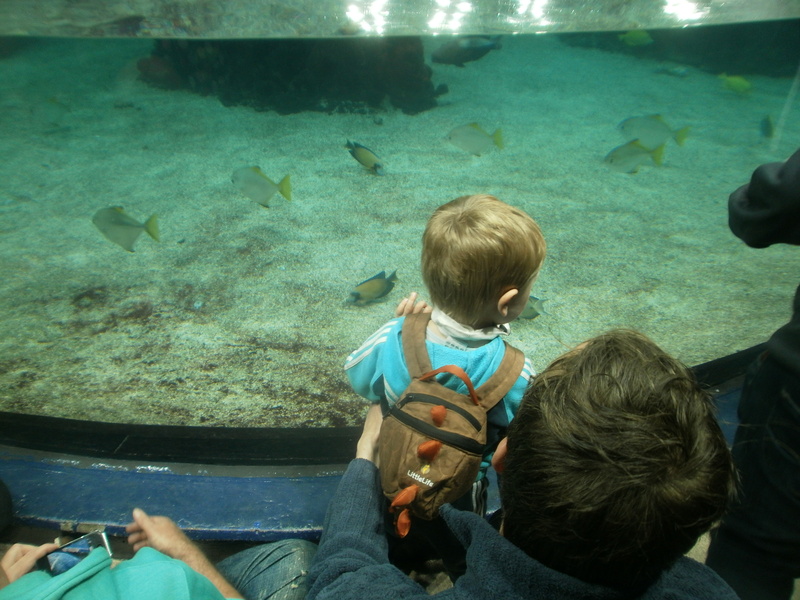 Once back at Deep Daddy took the buggy to car while Mummy & the boy queued in pre-paid ticket line to get our tickets – trying to fill in the form for the annual pass was fun with a LO hanging on your arm – was glad to see Daddy. We had a great hour and a half wandering around the exhibition looking at all the fish. He enjoyed seeing them and looking at the different sizes. 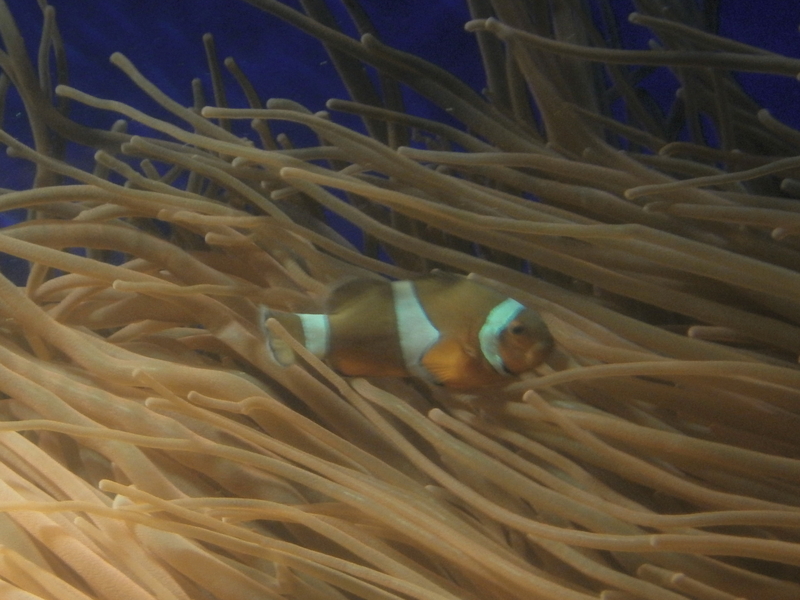 We did find Nemo (as he announced) as well as many other fishes. The boy insisted at end on climbing back upstairs by himself which was fine if a little slow at times – you go to top floor at start, wend your way down on ramps and then go all the way back up at end just to come all way down again. Following this we gave him a treat by finding a McDonalds – he has been spotting them whenever we go past one … one of the sounds I certainly do recognise now. He was very good and actually stayed with Mummy and didn’t demand Daddy came and sat next to him. Pushed a little at boundaries – but on the whole was easily distracted and quite happy to wiggle around on the bench seat he and I were sharing. By the time we had finished was quite late due to the time it took us to find McDs (why is it you pass them all the time but when looking for one cannot find them – we missed one in Hull as we came away which was annoying but wasn’t worth using junction to turn round on). We drove the long way home as needed to waste a bit of time to make sure FC was home – he happily feel off to sleep and I once again had to fight my tendency to do the same as T is not as familiar with the roads as I am. Eventually got back to FC – via a short stop at Sainsburys for a nappy change and also picking up some cold medication. Both T & I are fighting bad sore throats today so reckon we have picked up the cold everyone in FC house has had recently. Oh well I get enough colds anyway during winter – just hoping it doesn’t last too long. Definitely early night tonight as another early start in morning. Short day as FC having the boy’s leaving party in afternoon so we have a free afternoon to get some bits and bobs done.